If you are reading this blog post, you are already considering making a move. In my experience recruiting Lawyers for the best part of 20 years, a move is always a good idea once you have identified reasons to leave and what you are seeking to achieve by moving. The following 5 reasons explain why you won’t regret making a well-considered move. 1. Your needs are no longer being met in your current firm. As a graduate you may not have had much choice in where you worked. Many Lawyers we meet took one of the first positions they were offered as a graduate. Moving laterally as an experienced Lawyer enables you to make a more informed choice about your future career. Issues we often see addressed include questions of work/life balance, type of work, salary and potential for advancement. A good recruitment consultant is able to provide detailed information on the opportunities enabling you to choose the right opportunity to achieve your particular career goals. Moving firms is one of the few times when you will achieve an increase in salary above annual review level. As recruiters we often achieve uplifts of 10% to 30% on moving for well trained and experienced Lawyers with 2-8 years of experience. It is rare to see more than 3- 6% increase in salary reviews in this market. The legal profession is undergoing a period of constant change. Moving firms enables you to learn new skills and adapt to new working environments, clients and partners, gaining skills for your career long term and increasing your commercial knowledge base. In the interview process you should also ask what the firm is doing to address the rapidly changing legal landscape. The days of staying with a firm for life are over. Lawyers today are prioritising experiences and opportunities for engaging and fulfilling work over the traditional partnership track. Each job is considered an opportunity to expand skills and leverage on existing experience to level up remuneration and create a springboard for the next level. The traditional partner track has given way to a new career path less linear, slightly messier which can be very rewarding. 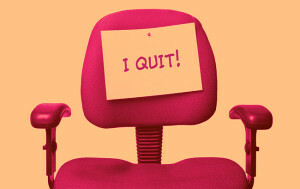 Too many short term moves can pose a problem for job security in the longer term. Take the time, ask a good recruiter for advice and plan each move with research and caution so you will reap the rewards! /wp-content/uploads/2017/03/empire_logo_MID_withoutpeople_Edited.png 0 0 Creekstr33t_admin /wp-content/uploads/2017/03/empire_logo_MID_withoutpeople_Edited.png Creekstr33t_admin2016-11-08 04:29:232017-12-01 14:03:50Is the grass greener? 5 reasons it is and a word of warning! Resigning is very stressful. Regardless of the circumstances – if you dislike your current job, or your supervisor, or colleagues – most people become anxious about giving the news. There are two factors at play – the fact that you are in effect rejecting someone and the fear of how that might make them feel, and the knowledge that you will, unless your employer asks you to leave early, have to work out a notice period in a job you don’t want to be in anymore. It is often the case that once someone starts looking for another job they have mentally ‘checked out’ of their current job, so the time between making that decision, looking for roles, accepting another role, resigning and working out your notice can often be long. The most important thing is to remember that you are still employed, and being paid, by your current employer. Maintain your composure and continue to work in the best interests of the firm – don’t forget you will probably be wanting a reference and the best way to ensure a good one is to be responsible. Even if you have done a great job in the past, if you drop the ball in your notice period that will be lasting impression for your employer. Resign in person. Write a resignation letter, but give it to your employer in person. Yes, it’s hard and uncomfortable – however emailing a resignation, unless your employer is away and you can’t wait, is just rude. Your resignation letter should be short – there is no reason to go into detail about the reasons. Once something is in writing it is hard to take it back. A wise person once said ‘Don’t do something permanently stupid just because you are temporarily upset’. Give the appropriate amount of notice – even if it’s three months! If you want to shorten the notice period say so, but the notice period is a legal requirement of your contract. Taking leave as part of your notice is not acceptable without your employer’s express consent. Depending on the circumstances of your role, and if it is possible with your new role, offer to be available to assist with telephone queries for the team or your replacement. It is a small gesture that will provide much goodwill. Try not to talk incessantly about your new job and how fantastic it is going to be, or how much more money you are earning. That will just tick everyone off. Now – approach your new role with nothing but a positive attitude.